Just so we're clear: the new Frame store on Fillmore Street is not a frame shop. But you came for the talk of champagne and jeans, so let's skip the Frame factoids and cut to the chase. 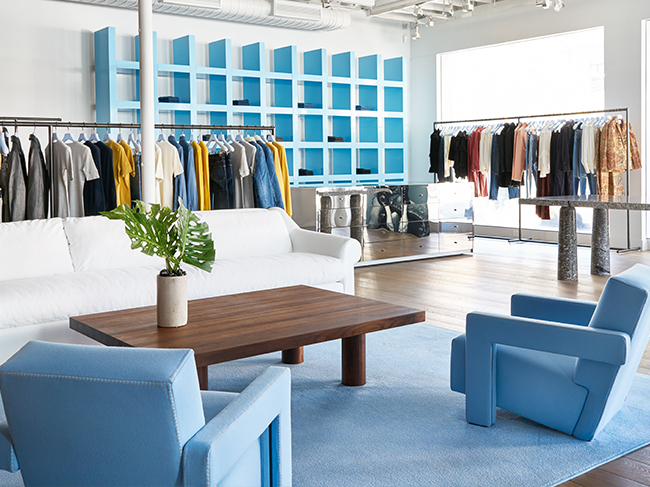 Frame moved into the former Marc Jacobs space at the corner of Fillmore and Sacramento (2142 Fillmore Street) at the end of September, and the store sells more than just jeans. Inside, there's a selection of women's sweaters, jackets, tees, and leather, along with a collection of men's jackets, t-shirts, and jeans. The staff is incredibly attentive, and will set you up with a glass of water or champagne while you shop. If you want to kick back while you wait for a friend or significant other to try on all the things, there's a comfortable sitting area in the middle of the store. Frame's opening just happens to coincide with the company's friends and family sale, so you can score 25 percent off your purchase right now, (though some exclusions apply). But if you're looking for those 40-inch inseam Karlie Kloss jeans, you'll need to shop online or in LA. Apparently we don't have enough glamazons in San Francisco to justify stocking that style. Hey, Levi's! Can San Francisco Be the Woke Test Market?